Once every two years the whole of the Potato Industry comes together for this unique ‘seed to shopping trolley’ event – the British Potato exhibition. It’s an exceptional networking and business opportunity for all those involved in growing, handling, processing and retailing the crop in this £multi billion industry. 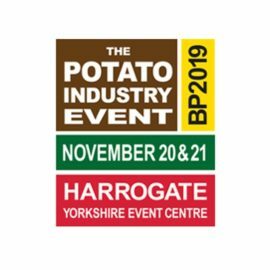 The BP2019 British Potato event will be held at the Yorkshire Event Centre in Harrogate on Wednesday 20th and Thursday 21st November 2019 and Tong is delighted to be an Official Sponsor at the 2019 event. Yet another unmissable date in the potato industry calendar presenting stands and demonstrations from leading service providers and manufacturers within the industry. We look forward to seeing you at the event. Come and visit us to find out more about our latest range of market-leading potato grading, washing, processing and handling equipment.